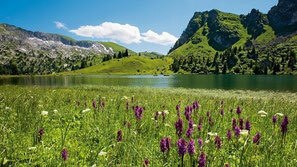 Zweisimmen (945 m above sea level) is the eastern gateway to the Gstaad region. The village is the entrance to the region's largest ski area and also shares attractive hiking areas with the Saanenland. The village offers a wide range of shopping opportunities in its traffic-calmed village centre. The medieval parish church, theObersimmentaler Heimathaus and the Caste Trail showcase history and tradition in a very compact space.